Emma and Rosemary are twin sisters who have fond memories of making Toas-Tite sandwiches after school in the ’50s. They originally found us back in 2009 and we have loved every one of their comments. Now here we are in 2013 and Boy and I have been so tardy on actually trying out one of their favorite sandwiches – an egg sandwich! This post is dedicated to these two wonderful ladies who inspire us and share the joy of Toas-Tites with those they love. Prep your sandwich grill by spraying the inside with cooking spray. Place one slice of bread in one of the clamshells of your grill. Crack your egg into a bowl to ensure that you get a good egg with no broken yolk. Press your bread down into the clamshell to make sure you have a bit of a dip in the middle of the bread where your egg will go. 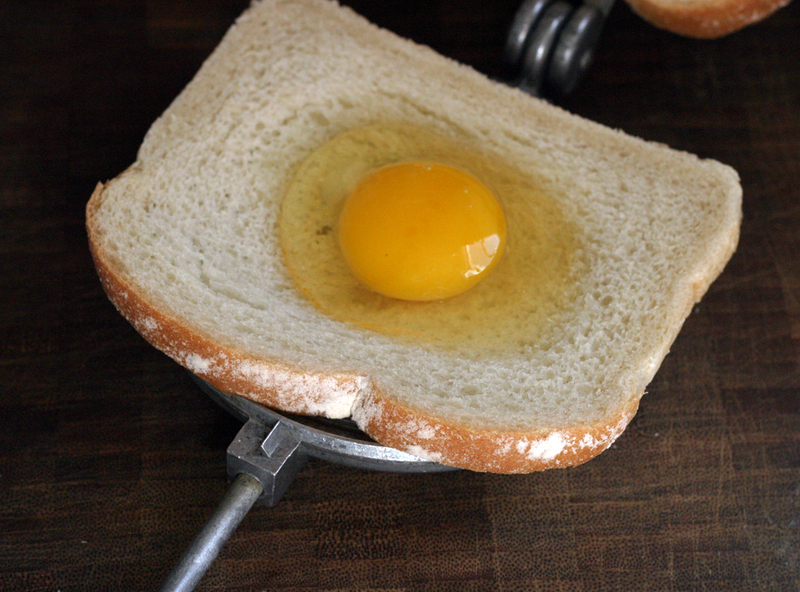 Pour the egg on top of the bread. If you’d like, sprinkle a bit of salt and pepper on top of the egg. Carefully place the second piece of bread on top of the egg. Close the grill and trim the edges of the bread. Take the sandwich out of the grill, let cool, and enjoy! * Depending on whether you like your yolk a bit runny or fully cooked, you may want to adjust the cook time. Boy and I both like a soft yolk so for 4 minutes on each side over medium heat was great for us but if you’d like a fully cooked yolk, you may want to up it to 6 or even 8 minutes on each side or increase the heat. This sandwich is so simple and so divine. Of course, pairing it will some bacon never hurts but I have no doubt, this sandwich will become a breakfast, lunch, and maybe even brinner regular. Thank you so much, Emma and Rosemary, for everything you’ve shared with us! 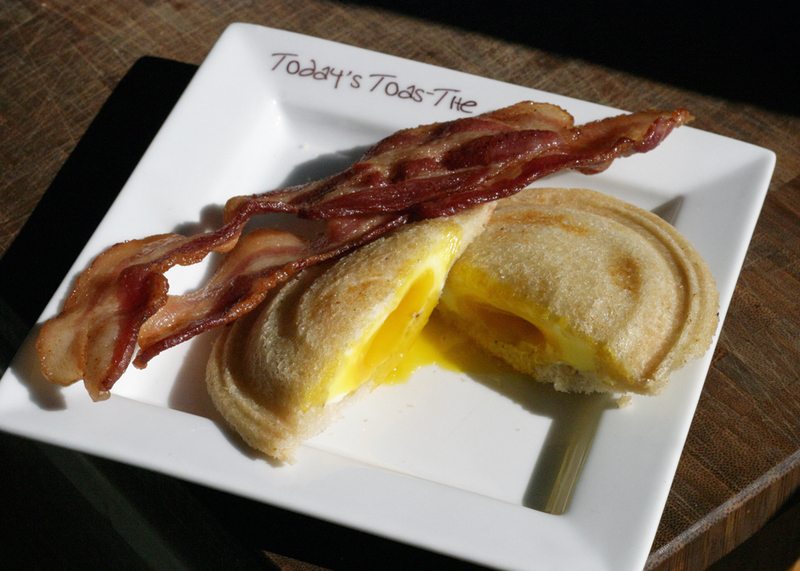 Girl, thank you so much for showcasing our yummy egg sandwich. We do have many fond memories of our after-school ‘Toasty’ treats. You guys are too much. I just made a ham and cheese sandwich on my Toas-Tite. Could not be better. Thanks for taking the trouble to post these recipes. Now I will use this pup more often….. Thank you so much! We love to create these recipes, and we love even more that people use them. Glad the Ham and cheese turned out! This was wonderful! I used an extra-jumbo egg and sprinkled a bit of grated cheddar and Aleppo pepper on top. I did 5 minutes on each side (2 minutes twice, then 1) but the yolk was firmer than I like, so 4 minutes next time. The white was unbelievably fluffy and yummy! I loathe applesauce but I DID try Nutella! Karen, how about peach slices? Or even pears or apples? We use to call these “Hiding eggs” and would slice around the small circle at the top to open up the yolk then dip small segments of the outer rim into the yolk.